Christmas Decorations in France represent traditions somewhat different from ours. The entire holiday season is used for celebrations, from the beginning of Advent to the Feast of the Epiphany. 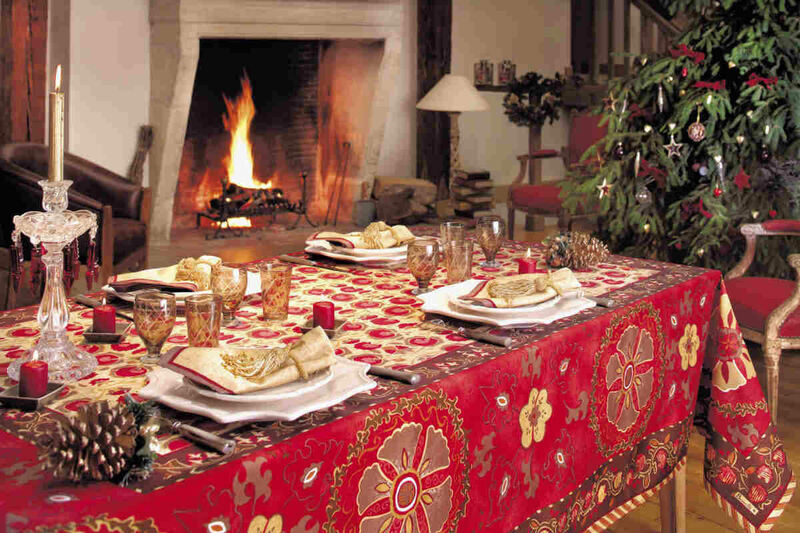 French Christmas decorations, special French holiday linens and Christmas home decor reflect these traditions. It all begins for the children when the Creche is set up either in the living room or the dining room. Joseph and Mary and the many animals are in their places but the baby Jesus and the shepherds and wise men are not. They are placed in other parts of the room far away from the creche. Depending on the behavior of the children they will only be gradually moved toward the scene. If the children have been good during the day, they may then move the figures closer to the scene by a bit. If they have not, the figures are moved backward a bit. Oh, the responsibility! How can Christmas come if those characters are not in their place on time? There is another twist to this based on French history. During the French revolution, the Republicans forbade the use of religious symbols and the celebration of religious holidays. Well, the French know how to deal with bureaucracy and deal they did. New figurines called “Santons” were produced based on the original characters but fashioned after the people in the village. Rather than the figures seen in the biblical pictures we are all acquainted with, they used figures of the butcher, the baker, the farmer, the fisherman, and all their wives and children in typical dress of the region. Should someone come to inspect their homes to see if there was any religious material in them and saw the figures, no charges would be made because of course they we only of the townspeople. The tradition grew and persisted and today they have become a cherished part of the holiday tradition. December 6 brings us two traditions. The first is the retelling of the story of St. Nicholas as it is known in France, Belgium and other places in Europe. It is about three young boys who are out playing in the evening when it became dark. They lose their way and stop at a butcher shop to ask for help. The butcher and his wife pretend to help them, kill them and then grind them up to add to their sausage meat. Just as they have completed their grizzly task, St. Nicholas knocks at their door to inquire about their whereabouts. The couple denies knowing anything about them but St. Nicholas knows better and with a wave of his cane they emerge from the sausage vat none the worse for the wear. It is unclear what became of the butcher and wife. All over France, in the early evening, this story is performed in churches and city squares. Then comes the procession. There are bands, floats, horses, and all the things we expect in a really fine parade. But the best part is that St. Nicholas is also there and the children all know they will receive their presents from him if they have been good. The amazing thing is that all over France there is no child who has not been sufficiently good. See a lithograph of St. Nicolas and the three boys in our e-store. Christmas itself is a quiet holiday spent with friends and family. Good food is abundant and the house is decorated beautifully. The Christmas tree is not a center piece as it is here, so there may not be one; but with all the best crystal, china, silver and other family heirlooms out for use, the houses are warm and hospitable. January 6 is the Feast of the Epiphany and that also receives attention. A fine dinner is prepared and as dessert a special cake is served. Baked into the cake is a small token, it may be a figurine, a button or something that has been a tradition in the family for years. The person who has the piece of cake with the token in it is declared king or queen for the evening and is presented with a crown and receives very special attention until bedtime. The next day, sadly, the season is over and all the finery is put away until the next December. Several Christmas table cloths are shown in our e-store. Also, Raffaello by Beauville is beautiful and has the advantage that it may be used for other celebrations since the design is not exclusively focused on the season. We also offer a range of holiday tea towels by Beauville. The colors are bright, the designs are definitely for the holiday and they make nice gifts for use or even framed for display. I hope you enjoy them as much as we do.